Run Junkie: The Drop Bag: How Much Sodium is in Those Gels, Bars, and Pills? The Drop Bag: How Much Sodium is in Those Gels, Bars, and Pills? Water, calories, and salt form the grand triumvirate of ultrarunning nutrition. Go off-program with any one of them, and you can forget that PR and may even have to hitch a ride home in the old broom wagon. 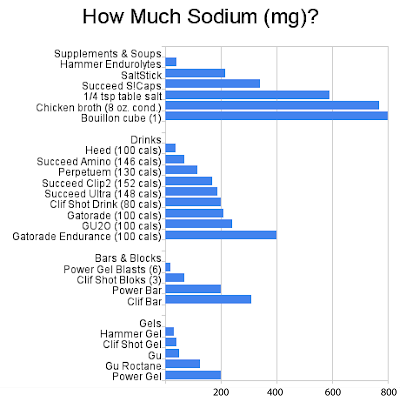 This past season, I really tried to focus on my salt consumption and thought it'd be interesting to collapse the sodium content of some common nutrition products into a single chart to get a sense of where things fell (see below). For the savvy runner, there are aren't too many surprises here. Hammer products remains typically low in sodium. Power Gels are the sodium king in their category. And chicken broth/bouillon blows the top off of everything. One real surprise, though, is the newest formulation from Gatorade Endurance, which packs a whopping 400 mg of sodium in a 100 calories serving, easily beating out the other sports drinks in that category.